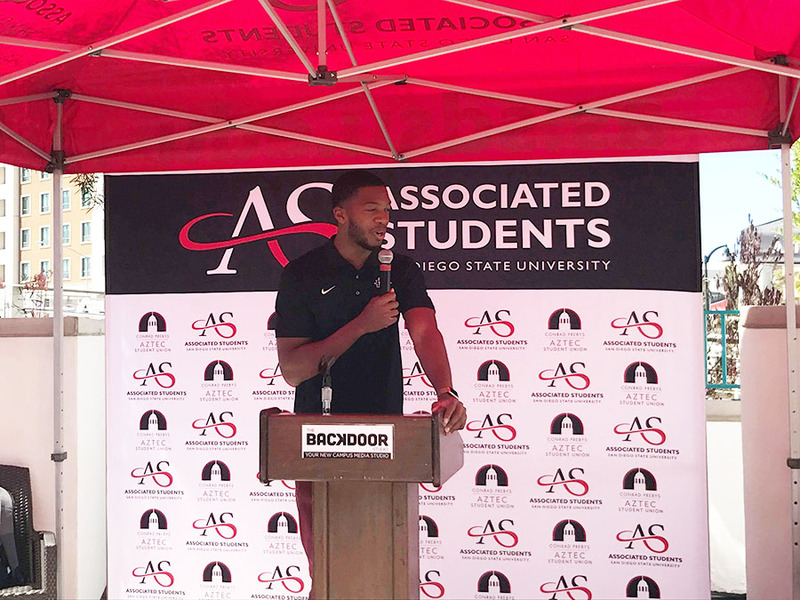 A.S. President Chimezie Ebiriekwe speaks at the grand opening of The Backdoor Room, the university’s new media studio. San Diego State’s new media studio, The Backdoor Studio, plans to make high-quality media equipment accessible to students from all majors. On April 17, students and faculty gathered in the student union to celebrate the grand opening of the new media studio. Associated Students President Chimezie Ebiriekwe said the studio may even be the first of its kind. “We believe that this one is (one of) the first, if not the first, media studio located in a (university) student union,” Ebiriekwe said. According to the A.S. website, The Backdoor Studio features equipment and software for audio and video recording, editing, green screen filming, professional headshots and other media-related activities. These services are available to all students who make a reservation though the A.S. website. A.S. Executive Vice President Vanessa Girard said this project has been three years in the making and was largely a student-run operation. “The Backdoor Studio was designed by students, for students, and is operated by students,” Girard said. Theatre, television and film senior Phoebe Williams, who helped get The Backdoor Studio operating, said one of their main focuses in working on the project was making the studio accessible to students from all majors. Recording technology and audio design junior Lydon Quill, who will be working at The Backdoor Studio as a technician, said students will have opportunities to work with many different kinds of state-of-the-art media equipment. Ebiriekwe said the name “The Backdoor Studio,” originated from a small music venue that used to be on campus. “Although the venue only fit 250 people, from 1968 to 2011 the Backdoor hosted over 5,500 musicians,” Ebiriekwe said. According to the Associated Students website, the venue used to host artists like Patti Smith, the Ramones and Metallica. Throughout its 30 years on campus, The Backdoor became a staple in the local punk scene. “Our hope is that the Backdoor studio will generate as much imagination, creativity, artistry and moments of pure fun and happiness that the original backdoor did,” Ebiriekwe said. Williams said she hopes the studio will become a space for all kinds of artists.